By mid-century, however, imported fresh apples and concentrate from Australia and New Zealand began to enter the U.S. market. Sebastopol apple farmers and processors thrived until the 1990s, when they faced new competition from China, which now dominates the global apple industry (conventional and organic). Today, many of Sebastopol’s apple orchards have been converted into vineyards. However, a few farmers are still carrying the torch. 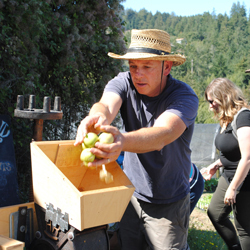 On September 6, at the height of the apple harvest, CUESA visited two Ferry Plaza farms that are paying homage to Sebastopol’s apple farming roots in their own unique ways. Our first stop was Flatland Flower Farm, which, contrary to its name, is known at the Ferry Plaza Farmers Market for its vegetable seedlings and heirloom apples. In the 1990s, Dan Lehrer and Joanne Krueger started selling their backyard-grown flowers and flower starts (hence the name), and after some initial success, the couple decided to take the leap into full-time farming. To conserve water, a scarce resource in West Sonoma County, Dan and Joanne have taken their apple trees off of irrigation, allowing them to stay hydrated naturally through a technique known as dry-farming. While their main business is in organic vegetable and herb starts, they continue to bring some of their heirloom apples to the farmers market every fall, and press some of the Golden Delicious apples for cider vinegar. Stan and Susan Devoto moved to Sebastopol in 1976. The couple grew apples for processing, and Susan began to develop a cut-flower business. As Stan’s obsession with apples took hold, he tore out older trees and planted lesser-known heirloom varieties, which were high in flavor but with shorter shelf lives. With nearly 100 heirlooms grown in the orchard, Devoto Gardens moved away from apples for processing to selling fresh at the market. “Sebastopol has the perfect environment for apples,” says their daughter Jolie. 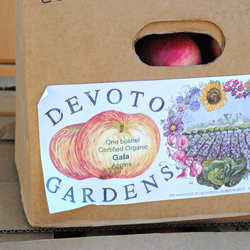 “Apples love cool weather, especially these tart and charismatic varieties.” All of Devoto’s apples are organic and dry-farmed. Product diversity has allowed them to keep their business going strong year-round. In addition to apples and flowers, the farm grows wine grapes for a few boutique wineries, and Jolie has launched a line of hard cider using the farm’s Gravenstein apples, Sebastopol’s signature heirloom, hearkening back to the region’s past. Join us for our next farm tour on October 6. Learn more.